Audible.com as the largest online audiobook store in the world, it provides a large amount of different kinds of audiobooks for the users. The audible audiobooks are also DRM protected as other online purchased digital content. 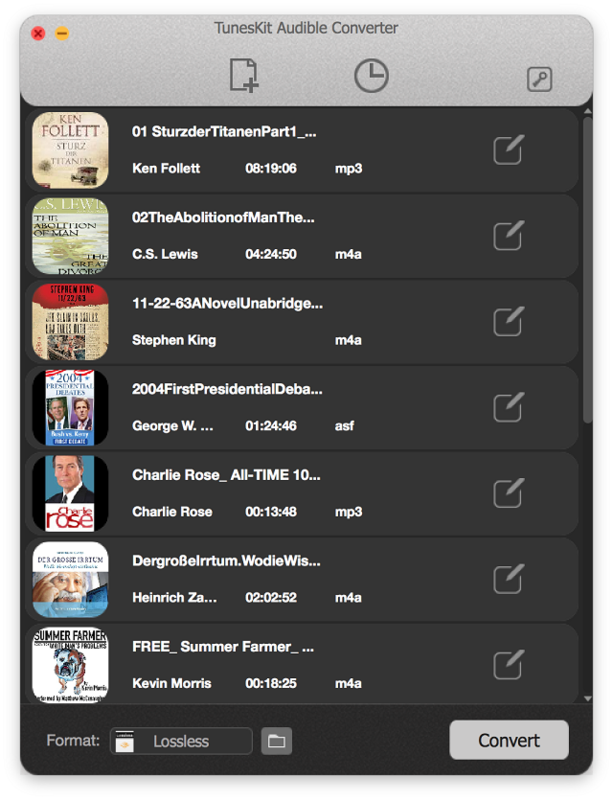 All Audible files are encoded as AA/AAX formats, which are not supported by many other devices. In this tutorial you will learn how to convert the DRM Audible AA/AAX files to unprotected MP3 format on Mac with ease. To convert DRMed Audible files to MP3 quickly without iTunes, you will need to download TunesKit Audible Converter for Mac at first, the unique audiobook DRM removal tool. By adopting some new technologies, TunesKit Audible Converter for Mac can crack Audible DRM protection very fast without iTunes running and preserve the original quality better. 1. Run Audible Converter for Mac. TunesKit Audible Converter for Mac is compatible well with Mac OSX Sierra 10.12, OSX 10.11, 10.10, 10.9 and Mac OS X 10.8. But if you are running OSX older than 10.8, you have to update your Mac OSX at first. Click "Add Files" button, then locate the fold where you stored the downloaded Audible AA/AAX files, then select Audible files to import. You are also allowed to drag and drop the AA/AAX files to TunesKit directly. 3. Click 'pen' icon to edit the Audible files. 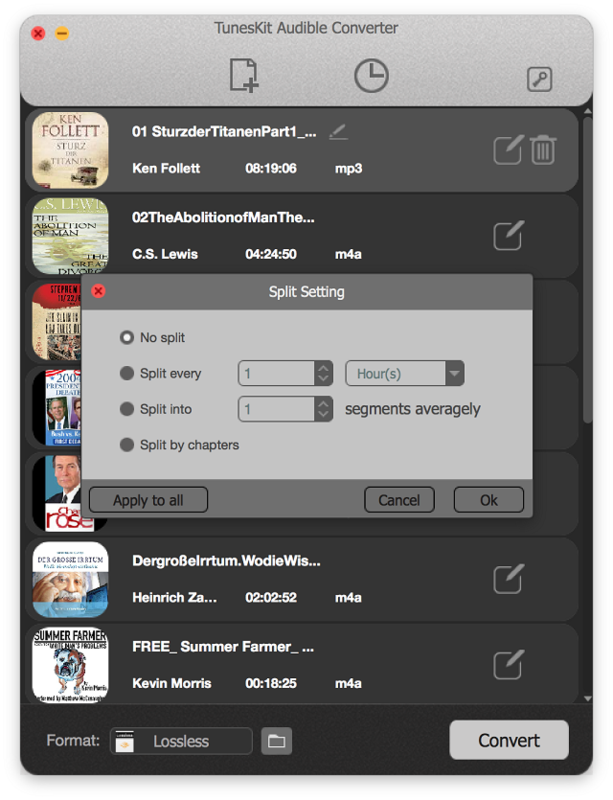 In this panel, you can split the audible audiobooks into segments by hours, minutes, chapters or split the files averagely. 4. Select Output Format as MP3. Click "Format" dropdown menu, you can get a list of output format to choose, such as MP3, AAC, M4A, M4B, FLAC, OGG, AIFF, APE, FLAC, WMA, WAV, M4R, MKA, AU, etc. MP3 is the most popular audio format for users, because it is supported by any media player devices and software. 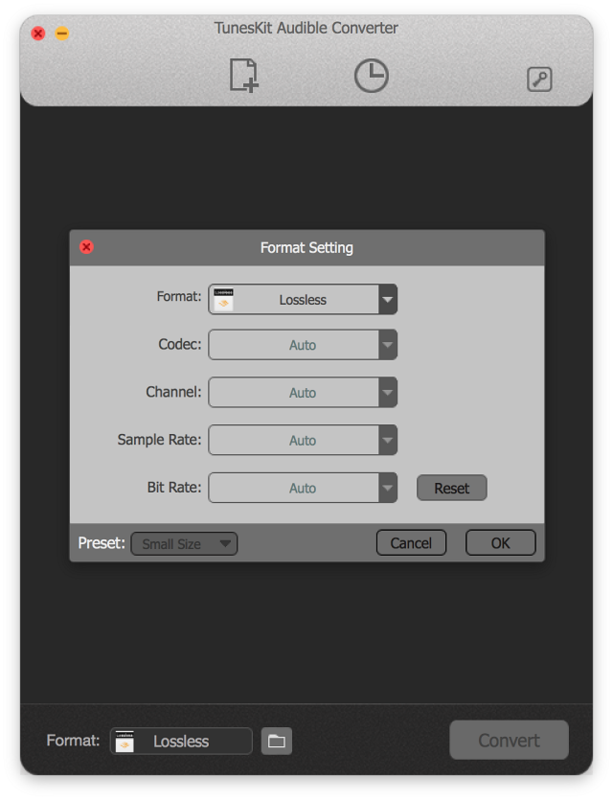 You can also preset the codec, channel, sample rate and bit rate in the settings panel for output files. By clicking "Convert" button, you can start to remove the DRM from Audible audiobooks and convert the encrypted AA/AAX files to common MP3 format now. TunesKit can do multiple conversions at the same time to help you save much time.